Every year sees the arrival of new trends, and this year it’s the Swedish term lagom that is set to steal the show, but what exactly is it? For the past few years, Scandi style has been at the top of the on-trend list. We know it as simplicity and functionality, but now it’s branching off and focusing on specific words and ideas from individual Scandinavian countries, as last year we saw the rise of the Danish word hygge. We have put together this post to shed some light on lagom, and make some suggestions to include it in your home and lifestyle. You might be thinking it doesn’t sound like the most exciting trend, but as Denmark, Sweden, and Norway are ranked the happiest countries in the world each year, it’s no wonder the rest of us have taken to adopting their designs and ideas – even the less appealing ones. The word is believed to have originated from an old Viking phrase ‘laget om’, meaning ‘around the team’. From a time when Vikings would share a drink of mead between them, and each person was trusted to only take a sip and pass it on so that there was enough for everyone. In 2017 it is being interpreted as living a pragmatic lifestyle. Making changes that will add value to your life in the long term, whilst not taking more than your fair share from the planet, whether that’s natural resources, energy, food, or water. 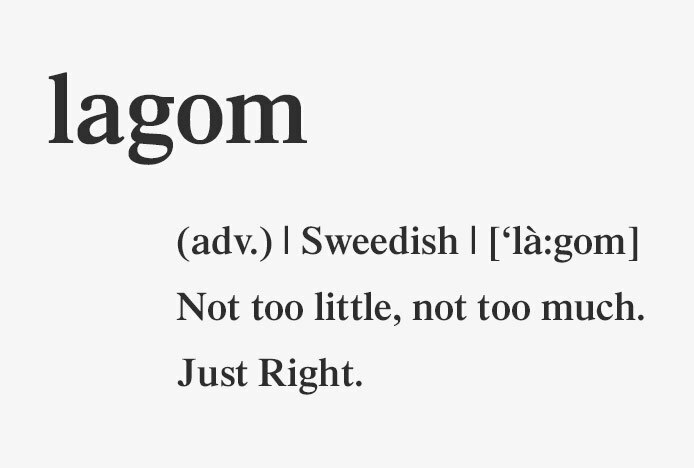 With the concept of lagom you can save money, appreciate the simpler things and learn to find the balance that is ‘just right’. Not to worry if you were a fan of last years ‘hygge’, which is about creating moments of comfort and contentment, you can still indulge in that this year too – as it’s all about moderation! When redecorating and remodeling, consider choosing sustainable materials. 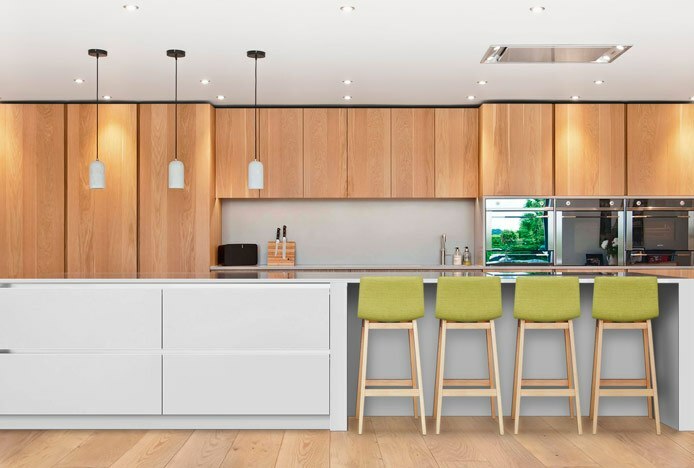 There are an increasing amount of kitchen designers committed to creating sustainable interiors at an affordable price, using materials like wood, recycled glass and plastic, bamboo, and cork. Sustainably sourced wood is ideal for flooring, kitchen cabinets, worktops, and furniture, as seen here in our wooden bar stools. Bamboo is also highly recyclable and can be used for baskets and accessories in the home. If you want a little more luxury in your interior, invest in products and materials that will last for years to come rather than throwaway items that will need replacing often. The colour and décor style is completely your choice, but with the addition of natural or biodegradable materials and features, a lagom inspired space tends to have an earthy colour scheme. Plus, this eco-friendly trend could be one of the influences for the selection of Greenery as Pantone’s Colour of the Year 2017, reinforcing the appeal of ‘going green’. 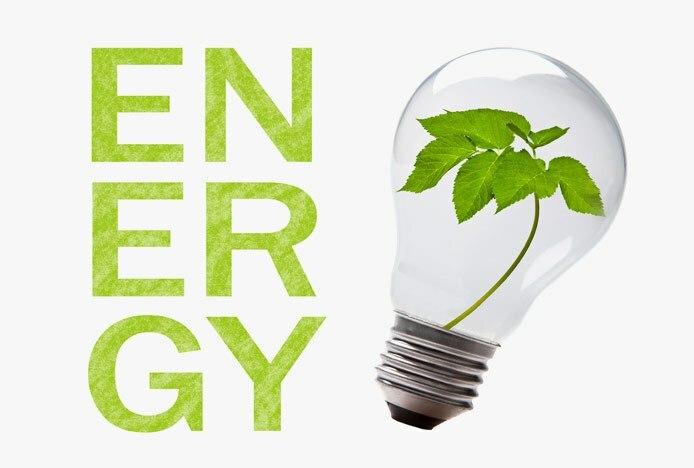 Consider what you spend in terms of energy, and not only will you reduce your impact on the environment, but you will be spending less on bills too. There are a number of ways you can be more energy efficient in your home, with lighting, appliances, and even furnishings. In the kitchen, upgrading your appliances can have a positive impact. For example, an induction hob only transfers energy to the pan and will heat up faster, reducing the amount of heat wasted and cooking time. Most fridges now come with eco settings, and it’s worth noting that a fridge will use more energy keeping cool if it is next to an oven. You could also invest in a dishwasher to save water, one load in the evening will use less water than doing several loads by hand throughout the day. Try and make better use of the natural light in your home, this could be as simple as adding mirrors to reflect light around the room. An easy change is to switch to LED bulbs, they consume less energy and last much longer. Guilty of reaching for the thermostat every time there’s a chill in the air? Adding textiles to a room will add warmth without turning up the heating! Curtains, blinds, and rugs on bare floors all contribute to draught proofing, and this is where all those soft fabrics and faux fur throws from hygge come in handy! Organisation throughout the home is beneficial, but in the kitchen it can help to reduce food waste and food bills. A clear layout will stop food being forgotten about and going out of date, for example, neat shelving with see-through labeled containers helps you to see the items you are running low on. Even planning your meals for the week stops you buying more food than necessary. Buying local food has a better impact on both the environment and the community, or become even more self-sufficient by growing your own. You’ll be able to provide fresh, pesticide free fruit and veg for you and your family, and it will save you money too. Plus, you are less likely to let food go to waste if you have spent time and effort growing it yourself. 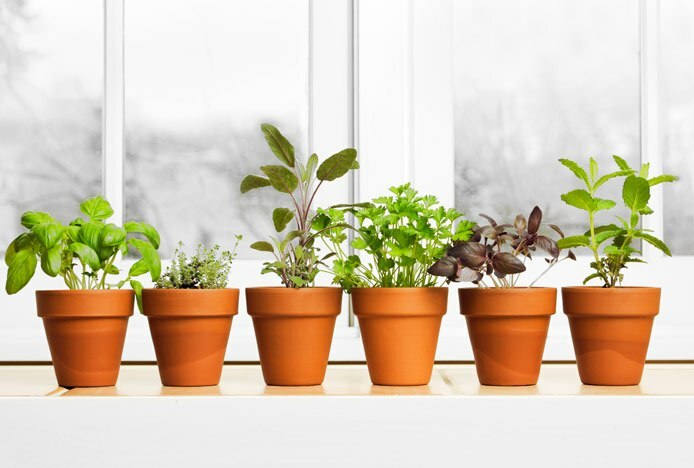 You could go all in and create your own kitchen wall garden, or if you’re short on space, make use of your windowsill and keep your plants and herbs within reach when cooking. 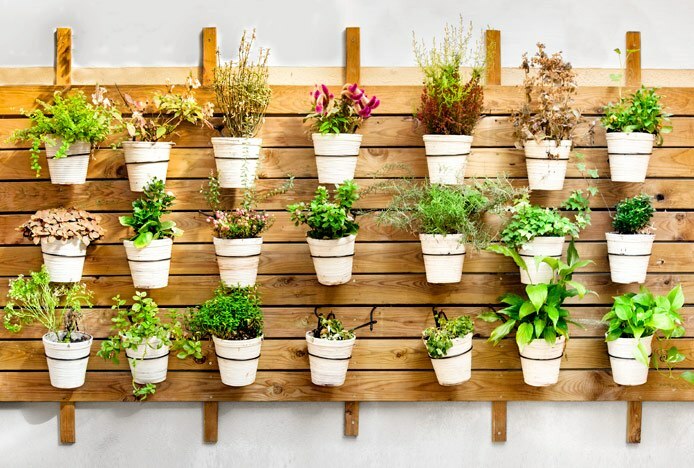 Start with easier plants like salad leaves and tomatoes, or herbs like basil and coriander, and then expand your garden once you get the hang of it. Not only is it your own supply of food but it will brighten up your interior too, and having plants in the home also purifies the air making a better quality living space. What with the current economic state and the constant reminder of global warming, it’s likely that lagom is here to stay. So, will you be introducing it to your home? Meet the latest interior trend that's visually striking and perfectly practical: Curves.. Featuring natural materials, clean lines and light spaces, Scandi style is clean and cosy.. Discover how to successfully combine contrasting styles in your home..
What is a Japandi Interior? 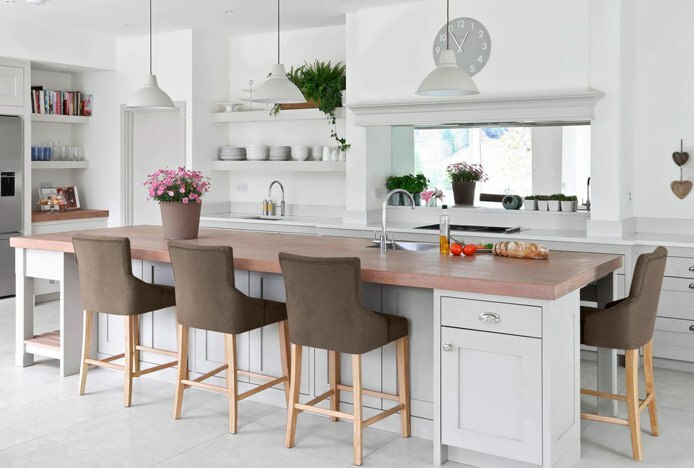 Mix Japanese and Scandinavian style for a relaxed minimalist look in your interior..
Six easy ways that you can use texture to liven up your kitchen design.. Whether your kitchen's a small space, or just poorly lit, brighten it up in 5 steps.. Staying in is the new going out! Pop the kettle on and relax in a cosy corner..